Germany is the economic powerhouse of Europe, and German companies occupy prime positions at the forefront of international trade and industry, science and technology. From Adidas to Allianz, BMW to DHL, Puma to Lufthansa, Siemens to Volkswagen – the best brands of corporate Germany are among the most successful businesses in the world. Continental Corporation’s automotive group is one of the German industrial giants pulling their weight on a global scale. Last year, it notched up over 19 billion euros in sales, and it has nearly 100,000 employees. Another major automotive player from Germany is ZF, which recorded over 17 billion euros in revenue from its drivetrain and chassis products/services, and has 75,000 workers on its payroll. As part of their run-up to the 65th Frankfurt Motor Show next month (September), both Continental and ZF gave media previews of their latest technologies that will make motoring safer and motorists, happier. Some of the more sophisticated systems are still in the proofing stage, several years away from mass production, but the ones highlighted here are all destined for the vehicles you’ll be buying/driving someday (soon in the case of “Whole Nine Yards” and “Different Turn” – see overleaf). Adaptive “autopilot” cruise control, handsfree vehicle “valet parking” and autonomous emergency braking are already available in the market. But these clever features are nothing compared to our first-hand “test drive” of Continental’s driverless prototype. Without a driver, the specially equipped VW Passat managed to negotiate a pylon-lines slalom course and stop for (dummy) pedestrians. The engineers believe that leaving the driving to the car is not only safer, it also allows the driver to better utilise his time behind the wheel – working, playing, chatting or maybe even napping. A self-driving vehicle would be most appreciated in bumper-to-bumper traffic jams, the bane of every motorist on the road. Naturally, an enthusiast would rather tackle a racetrack or a switchback “by himself”, so a full override will be part of any “Knight Rider KITT” certified as street legal in the future. The first affordable, fully automated vehicles for the motoring public will only become available a decade from now at the earliest, and they’ll likely be limited to expressways and a maximum cruising speed of 130km/h. It’s not just the nuts and bolts of driverless vehicles that carmakers and their original-equipment suppliers have to work on. They also need to worry about the relevant legislation, because existing road safety rules and motor insurance laws are based on the premise of a qualified driver in control of a vehicle. Bluetooth, USB ports and voice control let the driver “plug into” his dashboard, digitally. But these are fairly basic “connectors” in the big picture of HMI (human-machine interface), where the trend is to merge the world of cars with that of consumer electronics. Tomorrow’s in-car gadgets will offer attractive functions and intuitive operation – just like a modern smartphone. In fact, said device could become a newfangled motoring tool – for instance, by acting as a “virtual” car key using NFC (Near Field Communication), or by saving the driver’s preferred settings (for seating, steering, mirrors, music) and applying them to a ride other than his own, such as a rental car or a friend’s coupe. The smartphone could also play the “remote control” in a totally integrated, on-the-go mobile infotainment package. Connecting the car to the outside world is another important development ramping up for the future of personal mobility. It goes beyond telematics and satellite navigation. It’s something called “the Internet of Everything”, whereby every vehicle and the entire road infrastructure are interconnected cogs in a traffic “transmission”. It’s already in the works, with Europe’s Car 2 Car Communication Consortium (C2C-CC) bringing together a group of automakers, equipment suppliers and research organisations to develop, demonstrate and eventually homologate intelligent transport systems supported by vehicle-to-vehicle communication. It’s a little like crowdsourcing and cloud-computing for cars and the C2C-CC roadmap targets 2016 for the roll-out of initial series applications. ZF, a well-known German specialist in vehicle transmissions, has introduced the world’s fi rst 9-speed automatic gearbox, codenamed 9HP. Transversely mounted, compact and light, it will hit the streets in a variety of continental cars, with one of the first being the model-year 2014 Range Rover Evoque. We drove a test mule and can attest that the new 9-speeder makes a tangible difference to the step-off and the midrange acceleration. The smoothness of the shifts is in line with the current crop of 8-speed automatics, and thanks to an intergalactic top gear (the rev counter shows just 1700rpm at 120km/h), the fuel economy is claimed to be up to 16 per cent better than the original 6-speed automatic Rangie Evoque. The 9HP is ideal for front-drive applications, but can be easily adapted for four-wheel-drive SUVs. The gearbox is also ready for engines with auto stop/start. ZF executives have stressed that day-today efficiency, not outright performance, is their primary objective with the 9HP. 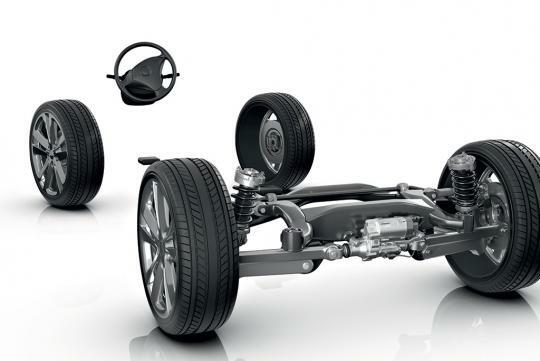 Entering volume production later this year is AKC (Active Kinematics Control), ZF’s high-tech rear-axle steering system that allows big saloons to combine breathtaking agility with unbelievable stability. It employs electro-mechanical actuators to change the rear wheels’ toe angle in concert with the front axle’s steering movements. At speeds of up to 60km/h, the rear wheels turn in the opposite direction to the front wheels, for greater nimbleness.Above 60km/h, the rear wheels point the same way as the front wheels, for greater stability, perhaps during a fast lane change. Best of all, the AKC algorithms can be programmed to make the car sportier or safer, allowing automakers to customise the system for a specific model or purpose. We’re already familiar with how active steering and torque vectoring help a car’s handling, but AKC transforms it. We tested a BMW 5 Series saloon equipped with AKC, and the benefits to dynamics are clear – smaller turning circle, less steering input required at low speeds, improved turn in at higher speeds, and unflappable chassis balance throughout. This article was written by Kevin Chin and Yang, freelance writers for Torque. I wonder if the car is equiped with these electronics 'aids',if accident,should we blame the driver or the car. ?Electronics can failed w/o warning....so cannot 100% depends on it. I got a friend's VW equiped with "Auto parking",the car hit an object,damaging it's bumper,but repair still need to pay himself..
All those driverless or auto stuff will come with pages of indemnity for u to sign. It will be technologically plausible but legally impossible. Park Assistance systems are to help you steer into parking spaces, not completely park for you. Same as cruise control or blind spot detection. If you change lane and hit someone even when the blind spot detection system said the road is clear, guess who will be legally at fault? Obviously the driver. As what I commented on the previous blog entry about the same topic I am definitely not a fan. Already skeptical about auto-parking, don't say driverless car unless you tell me if anything happens can claim from the car makers..